The European Commission and Morocco yesterday initialed an agreement covering trade in goods originating in Western Sahara without the consent of the people from the territory, contrary to the orders of the EU Court of Justice. The European Commission yesterday, 31 January 2018, initialed a new trade agreement with the Government of Morocco. The document was signed in Brussels, with two Moroccan ministers present. The deal ignores the judgment of the Court of Justice of the European Union (CJEU) of 21 December 2016, which stated that Western Sahara is a “separate and distinct” territory from Morocco, and hence that the representatives of the people of the territory ought to consent to any EU trade or association agreement affecting their territory. The document has not yet been formally endorsed by the so-called College of Commissioners, a formality which is expected to take place next week. It is not clear on which points, if any, this deal is different from the one that was struck down as invalid by the Court in 2016. The deal covers preferential treatment of fisheries and agriculture products originated in illegally occupied Western Sahara. "Western Sahara Resource Watch is deeply shocked by the rogue behaviour of the European Commission who shows blatant disregard for the judgment the Court of Justice and for obstructing the UN peace efforts in Western Sahara. Europe should be guided by the rule of law and moral rectitude, not cynicism and recklessness", stated Morten Nielsen of Western Sahara Resource Watch (WSRW). According to EU sources this sudden agreement came as a total surprise for everyone in Brussels. The Commission gave no signals about the upcoming deal when it briefed senior lawmakers the Parliament only a few days earlier. Reportedly, the Commission had stressed it was committed to comply with the judgment and was keen to consult various stakeholders, including Saharawi civil society and even the Front Polisario. That appears now to have been misleading and behind the scenes, the Commission was finalizing the deal. "This is an insult to the European Parliament and to the Court of Justice”, Nielsen stresses. From the very inception of the negotiations with Morocco, the Commission’s approach to the decision of the EU Court has fallen short of basic EU standards of accountable and transparent trade negotiations. A principle source of concern has been that the Commission appears to have deliberately misinterpreted the Court's conclusions that such agreements needed to obtain the 'consent of the representatives of Western Sahara' and instead sought to merely 'consult the populations of Western Sahara'. By replacing one with the other, it was thus possible for the EU institutions to sideline the Saharawi people, both by talking to the wrong people, and by not taking into account their fierce objection to the deal. “The Commission has seemingly not consulted anyone, irrespective of them being the Polisario Front, Saharawi civil society or Moroccan puppet organisations set up for the purpose of giving legitimacy to Morocco’s occupation. No steps appear to have been taken by the EU Commission, nor the EEAS, to obtain the consent of the representation of the Western Sahara people, the Polisario Front”, Nielsen stated. WSRW expects the agreement to be sent to the Member States and the Parliament in March, and that it will be addressed in the Parliamentary committees from April onwards. From what WSRW understands, the Commission has placed itself in an inestrictable situation during the negotiations, in which there were simply no possibility both to conform with the Court’s judgment while pleasing the Moroccan Government. This sudden initialing of the deal can thus be read as yet another signal of goodwill to an increasingly nervous Moroccan Government. And it buys the EU a few more weeks, until a judgment from the CJEU is passed on the legality of the EU-Moroccan Fisheries Partnership Agreement on 27 February 2018. On 10 January 2018, the Advocate General of the EU Court Melchior Wathelet gave an Opinion ahead of the court ruling, stating that the right of self-determination is an obligation erga omnes, and that the Union has failed to fulfil its obligations. He stressed that the Union has a duty not to recognize an illegal situation resulting from a breach of erga omnes rules of international law. Furthermore, the General-Advocate found that the Union rendered aid and assistance in maintaining the illegal occupation resulting from the breach of the right of the people of Western Sahara to self-determination, when entering into an international agreement with Morocco. All this taken into account, he concluded that the EU’s fisheries agreement with Morocco therefore is “invalid”, as it included the waters offshore Western Sahara. 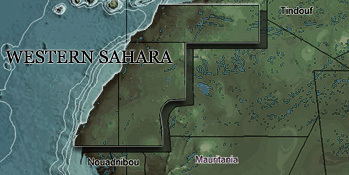 Other countries, such as Norway, Switzerland, Iceland, Liechtenstein and the US, have legal trade agreements with Morocco that explicitly do not apply to Western Sahara. The EU, under French pressure, is reluctant to follow that route. As late as 30 January, Western Sahara Resource Watch (WSRW) received an invitation by the European External Action Service (EEAS) – the EU’s foreign affairs service – to “an informal meeting” on 6 February where the EEAS would present its work to comply with the Court judgment and “to seek your views on the related benefits that could be derived for the population concerned by the agreement”. WSRW answered to that request on 1 February 2018, underlining that it is in no way representing the Saharawi people. In view of what is now apparently a done deal, WSRW also requested the EEAS to clarify the purpose of the meeting invitation. WSRW also stressed its confusion as to why the “benefits” of the “population” were to be discussed, as the CJEU (paragraph 106) had found that irrelevant in order to assess the legality of the agreement. Finally, WSRW stated that it is indeed interested to exchange views with the EEAS but that it does not want to engage in a process that risks undermining the requirement of obtaining consent from the representatives of the people of the territory, as a corollary of their right to self-determination. To ask the Commission whether the representative body of Western Sahara has given its consent to the agreement. To request a total list of the stakeholders, if any, representing Western Sahara, which have been consulted. To ask what the relevance of these institutions are, in view of the legal requirements that Polisario needs to consent. To measure the considerable legal, moral and financial risks related to doing business with occupied Western Sahara and to require from the EU institutions effective guarantees against such risks.